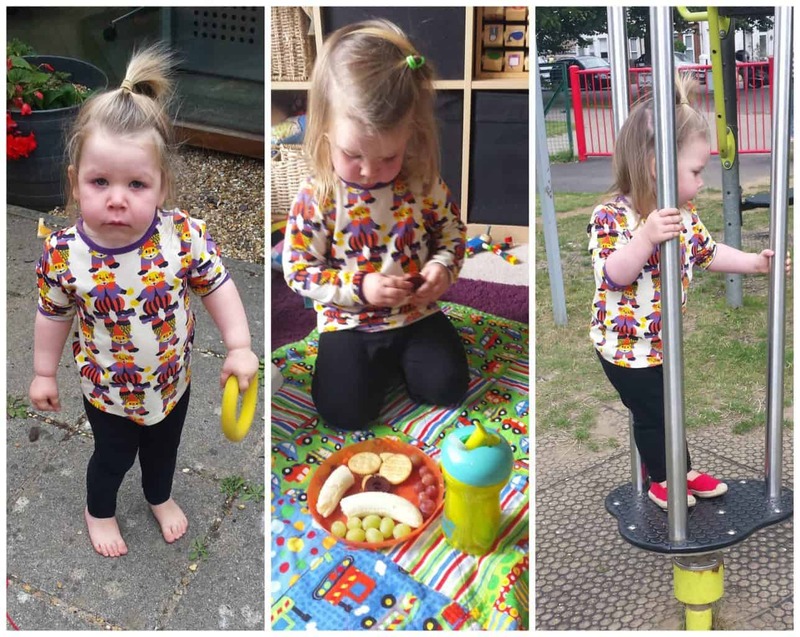 There are two items to showcase for this week’s ‘What the Toddler Wore’ and they’re both from Little Sunflowers an online children’s clothing website. 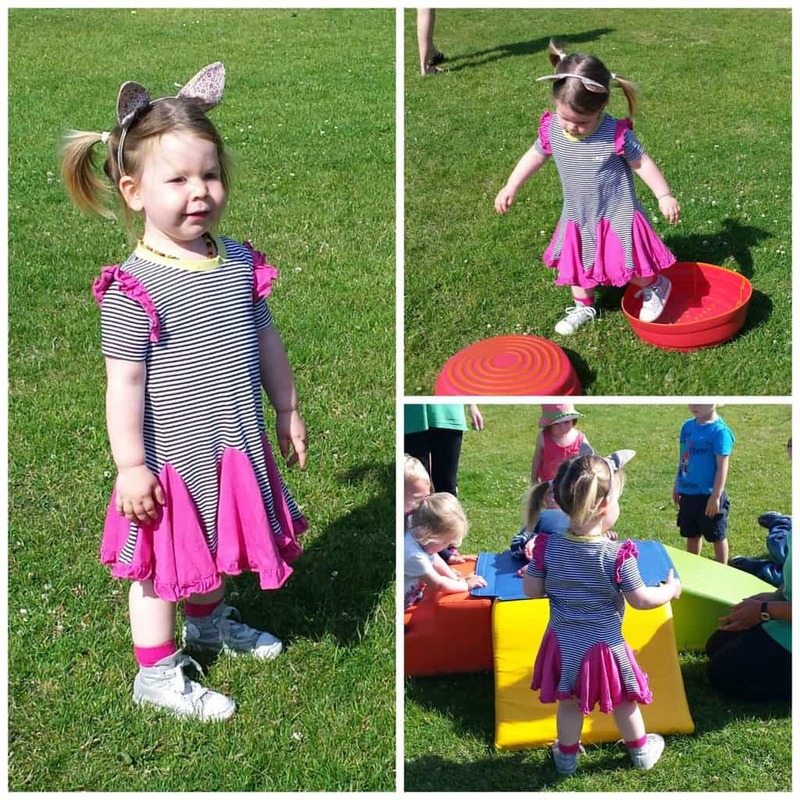 First up is a lovely Super Twirly Lily & Sid dress. Now I don’t normally choose pink things for Athena but this isn’t too OTT pink and she loved it when we were looking through the website so I got it for her! A friend we were out with thought the little L&S logo was for ‘Lauren and Sam’ which amused us! Nice and soft to wear, and super fun to spin around in too! It could be dressed up with tights and nice shoes but Athenas been wearing it mostly with high top converse and bare legs in this warmer weather! I think this will last for a couple of years as it’s a decent length and can be with leggings/tights as a tunic when she gets taller. Clown print T shirt by Smafolk. This is SO stretchy, which I love. It means not only does it slip over Athenas (large) head easily it means she can hurtle around to her hearts content at playgroups and the park without any restrictive sleeves or it riding up. Size wise I’d say it’s on the slightly larger side for an age 2 to 3 top which suits us fine! This one will definitely be kept for Arlo to wear too as it’s such a fun and gender neutral design and we’ve had lots of comments on it too! Worn here with black leggings and red espadrilles (from Baby Gap) I think it sets the print off really well, but we’ve also paired it with a pair of denim shorts that worked really well too! 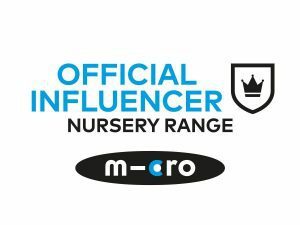 I dare you not to find at least five things you’ll want to buy for a small person in your life on the Little Sunflowers site! Plus you get free delivery, of a beautifully wrapped parcel too with the option to hold off on delivery until a certain date, so perfect for pressies! We were kindly given a gift voucher to put towards our purchases, all opinions are my own. Reviews: Crate Creatures Toys – interactive monsters! Getting Arty with the smART Sketcher Projector! Thank you for the lovely review – beautiful pictures! Such cute outfits, I’m a little in love with her bunny ears! I’ve just had a look on the Little Sunflowers website, you’re right, it is impossible not to find something! I’m currently drooling over the cupcake cardi & hat set! love the lilly and sid dress do they have any more in size 4-5?